For free Instead of breaking the bank to give your garden a nutritional boost, instead use what you already have. Composting is a great way to create an ongoing supply of fertilizer and, the best part is, it's free and easy. 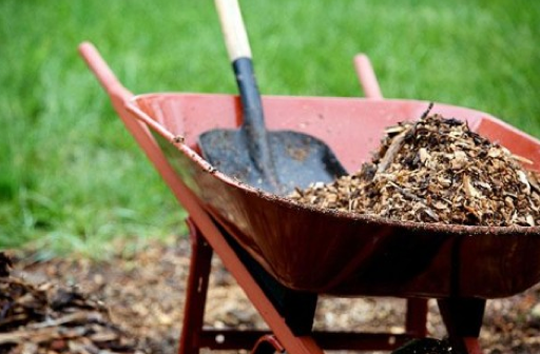 Yard waste in the form of leaves and grasses in combination with food waste such as coffee grounds, eggshells, and fruit and vegetable peels will turn into fertilizer over time. Put the waste in a barrel or compost bin, mix twice weekly, and you'll have homemade fertilizer in a few weeks. Chopped banana peels and coffee grounds alone add plenty of potassium and nitrogen to a hungry garden. Drip instead of spray It’s important that your watering efforts go a long way not only for your garden's sake, but your wallet's sake. If you're using water-wasting spray nozzles on your sprinkler heads, instead use drip lines throughout your flower and vegetable beds. And, try feeding your gutter downspouts into barrels and store the water for those dry days. Put an end to pests and pesticides Pests are bad for a garden and some pesticides are bad for your health. A 30% copper garden border will keep slugs and snails away and cayenne pepper will stave off the flying leaf-eaters. Likewise, placing newspaper and cardboard around the stem of tender plants will keep caterpillars at bay and planting herbs and spices such as rosemary, basil, and garlic will help prevent attacks from all kinds of garden-hungry insects. - If you must water, do so during peak sunlight hours so droplets don't freeze and kill delicate plants. About the Author: Adam Groff is a freelance writer and creator of content. He writes on a variety of topics including personal health, landscaping ideas, and home improvement.